The 16 year old farm car gave up the ghost this month and died the peaceful death of a bashed-up old warrior. We decided not to replace it and so we got a tow bar fixed to the other car. It took all of five minutes for me to bash my knee on it. Owowow. Spatial awareness is clearly not my go-to skill. Both Edith Pig and Effie Pig farrowed this month. Litters 134 and 135. Effie Pig is an old hand at mothering. This is her 10th litter. She's a bit deaf these days and shouts very loudly. I feel that this is because she can't hear herself properly. She only hears me if I am very close to her. Her piglets are very curious but also much more nervous than Edith's litter. I'm sure this is because of the way Effie reacts to sounds – she gets taken unaware and then barks a warning. Her piglets all then run away. Edith Pig is also a good mother but her piglets just want to trip me up, push over my bucket and chew my wellies. 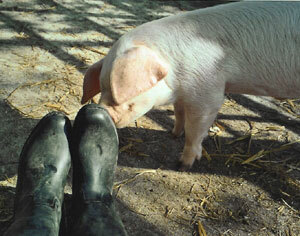 Who doesn't love having their wellies chewed by a piglet! Well, until they rip a hole in your posh, thermally-lined wellies… Edith is much younger than Effie and this is her 3rd litter. She's become a very relaxed mother now, after freaking out a bit when she had her very first litter. The swallows are gathering on the power lines in family groups. They'll be heading south to Africa in about three weeks. I love the way they arrive and leave on almost the same dates every year and re-use their old nests inside the barns and under the eaves.